Very,very hard day out ! Hi there, Today could have been the hardest full days fishing I have spent on the water in the Taupo region. Â After a busy week I decided that Sunday was going to be a day of leisure and I would wonder around the mighty Tongariro and slay a bag of trout. I purposely chose sunday as it was always going to be overcast and provide some good fishing conditions. I was aware that the weekend warriors wee going to be out in force but with local knowledge and youth behind me they were not going to hassle me as I had some little areas which I wanted to check out for future clients. One thing I did not take into account was the gusts of wind that constantly harassed the Tongariro all day and made casting near impossible in most pools. I pushed on and would not let one of natures strengths beat me down but god she made it hard for me and everyone else out there trying. I pretty much spent the in-tire day on the river chasing around different pools looking for shelter or sneaky holes that had not be fished yetÂ all for two hook ups!! I lost aÂ very good brown in the Stag again in the slack water of to the side which I had a moment to myself about (hate loosing good fish). I did not even see another angler carrying a trout so I was not feeling to bad until I watched some anglers of the road bridge. Â The only consistent flow of fish I spotted and saw caught was under that bloody bridge again on the true left and the true right. Why are these fish feeding here and not in the rest of the river at the moment? Have the locals developed a fly which we don’t know about? Is it a fly? Whatever they are up to down there it works but I just cant seem to get my head around it. I even waited my turn and had a chuck in there myself and still got skunked while a young maori boy continued having a ball!! The river is still low and clear and still has a small amount of slippery weed on the rocks which really should have been washed back to the lake by now in a decent flood and cleaned our pools up. Small naturals I would think will be working the best but as you can see they certainly didn’t care for my small naturals. White caddis seems to be the fly of the week and as long as it is in a size #14 #16 this should do the trick if they are there and willing to play the game. Last report I touched on high numbers of brown trout in the river this year and how we have all been able to get one or two which in the past they were quite the novelty. 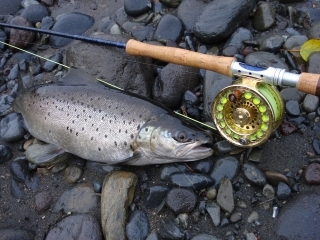 But did the river have high numbers of brown trout or were we in a better possession to see and catch them this year? I think the removal of the willows in the lower river must have had something to do with why they had pushed further up the river in larger numbers this season. By taking away great cover they simply pushed higher up to find better cover where they could relax and concentrate on spawning this allowing us to put ourselves in better possessions to catch them . Trying to even cast a line in the lower river in the past has nearly been impossible but with a good sense of adventure andÂ a day pack we were able to find alot more opportunity to catch brown trout. Anyway purely just another topic that appeared in conversation and there probably is a much more researched reason for the arrival of our wonderful big browns high in the Tongariro. Hope you all have some better fishing this week than I did on Sunday and I will lick wounds and head out again in a few days and report back with better luck I hope.